This THERAPEUTIC yoga class is open to any adult that is willing to learn simple yoga practices and use them as a tool in the process of healing from emotional trauma and/or chronic stress. All levels of physical ability & fitness are welcome. Latest neuroscience research is integrated in the tools and techniques offered in this class. Space is limited to 12 participants. When: Wednesdays, 12:00 –1:15 pm starting on March 13, 2019 through May 15, 2019. Ongoing enrollment and drop-ins are welcome. How much: $135 (one payment for all 9 classes, comes to $15/class) or $20 drop-in (space permitting). Discounts and specials are periodically available. Check website. Irina is a licensed psychologist in private practice in Knoxville. She specializes in the treatment of trauma. Irina came to yoga in 2002 while in graduate school in Ames, IA. Irina teaches yoga for chronic stress and trauma class focused on the students’ learning yogic techniques and using them at home to facilitate their healing process. This class is appropriate for trauma survivors and individuals, who live or work in chronically stressful environments (e.g., first responders, doctors, mental health professionals, lawyers). This class is open to all levels of experience with yoga and all levels of physical ability. Yoga Basics has something to offer to both beginner and advanced yoga practitioner. Class is slower-paced and focuses on breaking down specific asanas, or postures, including foundational poses commonly seen in vinyasa and other classes. You’ll learn safe alignment through instruction, demonstration, and hands-on assistance. Beginner students will receive the building blocks to practice regularly and more advanced students will find this class useful in deepening their practice. Class includes practice of various styles of meditation and pranayama (breath work). Learn, play, and maybe even break a sweat in a supportive environment. You don’t need to be able to touch your toes; you just have to be willing to try. After several years of practice, Amberly chose to deepen her path with yoga by attending Yoga Teacher Training at Yoga Landing in Chattanooga, TN with the inspiring and talented Jessica Jollie. After learning more than she ever expected from Jessica and the Yoga Landing faculty, Amberly immediately began assisting and teaching in the Knoxville area thanks to the wonderful Patty Dougherty. Amberly teaches and practices many forms of yoga including: Ashtanga, Vinyasa, Yinyasa, Restorative, and Yin. Vinyasa and Yin styles of yoga will be creatively blended together throughout this 60 minute class. Vinyasa (flow) sequences will link movement with breath to develop strength, balance, flexibility and focus. Yin postures will be incorporated throughout the class to practice stillness in poses designed to target the deeper connective tissues of the body. Restorative Yin yoga is a passive series of poses held for 3-5 minutes each. These poses target the deep connective tissues of the body and the fascia that cover the body to help regulate the flow of energy in the body. It is unique in that you relax in the posture. You soften and it can be meditative. Becky Jones is a Knoxville native and has shown an interest in yoga since her college days. She is also a Dental Hygienist and holds a B.S. in Health Education. Her desire to know yoga’s balance intensified in 2005 as her life changed and growing pains ensued. She studied yoga under Asheville’s Cindy Dollar (Iyengar Method) at the Glowing Body and she claims Patty Dougherty to be one of her most precious mentors. She has a love for vinyasa and yin and is a Reiki Master. Her personal yoga journey has brought her into a more balanced lifestyle, which she delights in sharing with others through teaching. Rebekah Knause, L.Ac., LMT, RYT is now a licensed acupuncturist. She recently graduated from Jung Tao School of Chinese Medicine and will begin offering acupuncture appointments at Balanced You Studios on at 6712 Kingston Pike in Bearden. To schedule an acupuncture session with Rebekah, call 865-888-5342. Breezeway and Balanced You Studios offer gift certificates in any amount for massage and yoga classes. There is no better way to take care of your loved ones than giving the gift of self-care. Connect with any therapist or instructor to purchase. KNOXVILLE, Tenn. (WVLT) – New guidelines from the American College of Physicians say the first line of therapy for back pain should be non-drug treatments. Jay Dee Clayton finds peace from his pain through yoga. “Whenever I start to feel a little twinge, I pull my knee out and stretch the area that’s giving me a problem and it dissipates. It goes away,” he said. But, yoga wasn’t the first place he looked for relief. “I took medication immediately after the surgery and I didn’t like feeling like my head was on a balloon string, so I looked for alternative methods of just managing through it,” he said. Several months ago, Cecelia Aurand also went looking for relief. “I’ve had spinal stenosis and back pain for quite a while,” she said. She, too, first tried the prescription route. “It didn’t really help. After I had the surgery it did help for a time but it didn’t last,” she said. So, she turned to acupuncture where she says she saw immediate results. “Within three sessions, I was walking normal again. It was amazing,” she said. “Many people are able to reduce or completely discontinue the use of pharmaceuticals to manage pain because of acupuncture,” said Dr. Will Foster, an acupuncturist at Traditional Health Clinic. The fact that both Clayton and Aurand were able to find relief outside of pain pills doesn’t surprise Dr. Samuel Yoakum. “There are certain types of pain that pills treat really well. They don’t treat chronic back pain well,” he said. New guidelines from the American College of Physicians back this up. The guidelines say the first line of therapy for back pain should be non-drug treatments. For pain lasting less than three months, those include heat wraps, massage, acupuncture and spinal manipulation. The authors stress that clinicians should avoid costly and potentially harmful treatments like narcotics. “Be as active as possible. That’s what we take from these guidelines more than anything else,” said Dr. Yoakum. Not all insurances cover alternate therapies. It’s important to consult with your physician or a specialist to diagnose what type of back pain you have and what treatment plan would be best. Ramesh Bjonnes has been teaching yogic meditation for the past 35 years. He lived in India and Nepal in the 1980s learning directly from the traditional teachers of yoga and Tantra. He is the author of two books on yoga, Sacred Body, Sacred Spirit (InnerWorld) and Tantra: The Yoga of Love and Awakening (Hay House India). 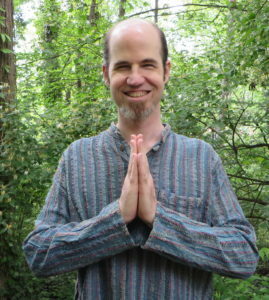 Tantric scholar and Professor of Religion at the University of Rochester, Douglas Brooks, says that “Ramesh Bjonnes is an important voice for the study of living Tantra.” Ramesh is the co-founder of the Prama Institute outside Asheville, NC, where he lives and teaches. Radhika Banu Bjonnes is an experienced yoga and meditation teacher with a personal, caring, and friendly style of imparting her lessons. Radhika is part of the growing “slow yoga” movement, and believes that a gentle yoga practice reaches deeper, makes us calmer and stronger. She taught yoga at the esteemed Ananda Marga Yoga Academy (AMYA) in Singapore for over 10 years. Here, she immersed herself in the study and teaching of Rajadhiraja Yoga, a traditional system of yoga focusing on breath retention and deep breathing while holding poses for a certain period. Radhika holds a Registered Yoga Teacher certification (500 RYT) with Yoga Alliance; a 60 hour certification and a 400 hour Diploma in Rajadhiraja Yoga from AMYA, and a 100 hour certification in Yin Yoga from Victor Chng. Breezeway Yoga and Balanced You Studios were recently reviewed in Knoxville’s Cityview magazine. We were thrilled to see instructor Jill Bartine on the cover as she is such an amazing spokeswoman for our studios and for yoga. The article offers a broad view of the Knoxville yoga scene and the various great yoga studios within our community. Click the page at left to read the article. Driving down Kingston Pike past the Kroger in Bearden, you may never notice the shopping center’s somewhat hidden breezeway connecting various businesses. Just beyond Wigs by We3 and Roger’s Shoe Repair shop, Patty Dougherty said she found the perfect location to open her newest yoga studio. Breezeway Yoga Studio, a cooperative of yoga instructors and therapists who offer various styles of yoga, opened in the Knox Plaza shopping center Aug. 1. The studio is located just down the road from The Practice Yoga in Western Plaza, which recently closed. It was where Dougerty’s four largest classes were taught. At the other end of Bearden, Dougherty, a clinical therapeutic practitioner, also co-owns Balanced You Studios at 6712 Kingston Pike with Rebekah Knause. It’s a smaller studio that opened two years ago and can accommodate up to 10 students or private or semiprivate instruction. “The first business is great. It’s profitable. I just needed a place for a larger class,” she said. Dougherty grew up in Knoxville, beginning her career working as a writer, producer and director at WBIR Channel 10. She was promoted to Chicago but later started freelancing, allowing her to travel around the world. She eventually made her way to Southern California, living on a sailboat for seven of her 10 years there. At the time, her weight had topped out at more than 200 pounds. Dougherty had just started studying yoga and mediation when her doctor suggested putting her on various medications. When her father became sick, Dougherty began commuting back and forth to Knoxville. In 2010, she moved back, making Knoxville her home. Breezeway Yoga Studio, which features cork floors, will offer classes that include yoga basics, restorative, vinyasa, power, flow and yin yoga. It will soon offer ashiatsu massage therapy, which uses feet to apply pressure instead of hands. Business reporter Carly Harrington may be reached at 865-342-6317 or harrington@knoxvillebiz.com.